Starfish are admired for their beauty and symmetry, and your guests will be overjoyed with these keepsake favors. 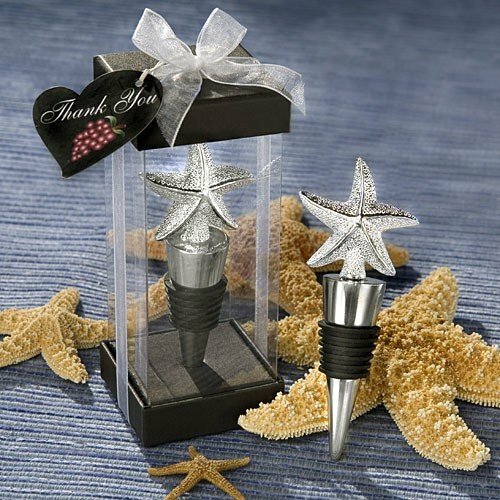 Each chrome wine bottle stopper features a dramatic 3D shiny pebbled starfish topper, and tapered shaft with rubber gasket to keep their wine fresh. Favors measure 4 1/2" x 3/4" x 2 1/2". This keepsake design is from Fashion craft's exclusive Vineyard Collection. They are individually packed in a signature clear box with a black bottom, elegantly finished with a white organza bow. A designer heart shaped thank you tag is attached making these the perfect favors for wedding guests or other event attendees. Can we personalize the labels on those ? We don't have personalization available with the Elegant Starfish Wine Stoppers, but we do sell personalized tags separately here.